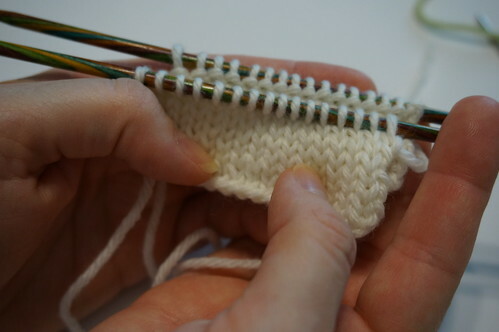 Most Kitchener stitch tutorials assume that you have stockinette to graft, and that is the most common occurrence – sock toes especially. So they give instructions to ‘Knit on, purl off. Purl on, knit off.” But what if you have something other than stockinette? That won’t work if you have a rib, or some combination of knits and purls instead of plain stockinette. I ran into that situation a while ago – I wanted to graft a hood on a sweater, and it had cables on the sides, with purls framing the cables, and stockinette on the rest of the hood. 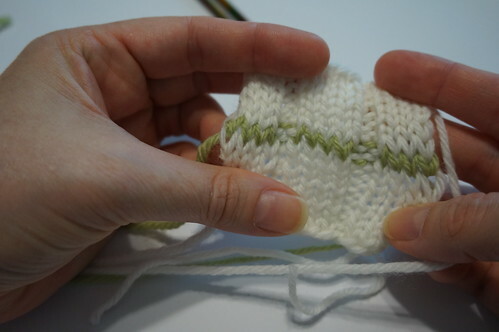 I researched, and came across a different set of instructions : “Same off, Opposite on.” Now, I always use this ‘mantra’, if you will, to work my Kitchener stitch. And I know no matter what stitch pattern I have I will be able to graft it using this. Kitchener stitch is just a fancy name for a sewn graft. You are essentially working a row of duplicate stitch between two opposing live rows. It gets a bit confusing and intimidating because instead of the work flat in front of you, you have half the knitting (the right side) in the front, and half the knitting (the wrong side) in the back. Until you get more confident (and even once you’re pretty good at it!) I suggest locking yourself away in a quiet room with no distractions to work Kitchener stitch, and DO NOT stop in the middle, or you may lose your place! Cut your working yarn a good 3-4 times longer than you think you need. Then thread it on a tapestry needle. In this case my yarn is coming from the front needle. 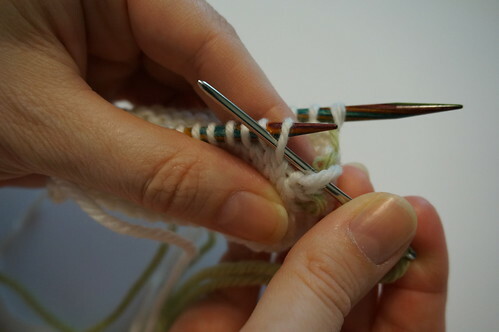 When you’re knitting in the round, your yarn will be coming from the back needle instead. Doesn’t matter! Just start with the front needle instead of the back needle. 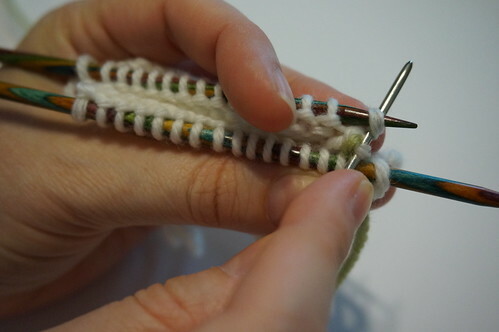 The first step is to work an “Opposite On” stitch on the needle that does NOT have the working yarn. Setup step one – “Opposite On”. I’m showing the needle above the front knitting needle for clarity in the photo -DON’T do that yourself- keep the tapestry needle UNDER the front knitting needle. 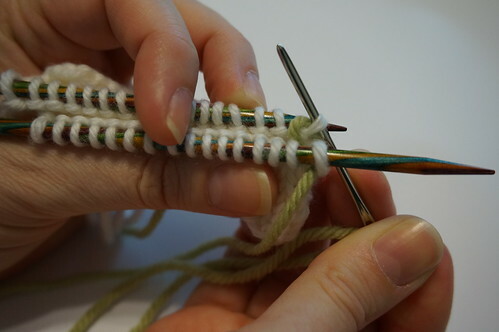 In this case the stitch is a purl, so put the needle into the stitch as if to knit and leave the stitch on the knitting needle. Now we need to work an “Opposite On” on the front needle. 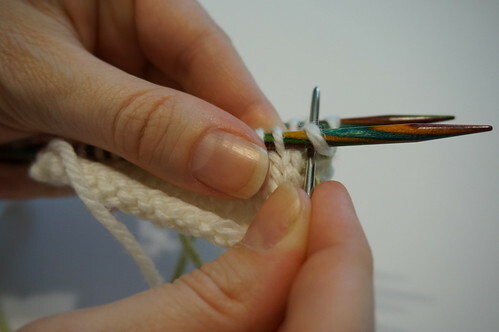 This is a knit stitch, so put the tapestry needle through the stitch as if to purl. Pull the yarn through, but do not pull it tight. We will fix the tension after everything is done. BE SURE to keep the working thread UNDER the knitting needles. This is very important. If you don’t you will have a big mess. Now we’re ready to start working the stitches off the needle. We last did the front needle, so move to the back needle and begin working the pair of instructions : “Same Off, Opposite On”. 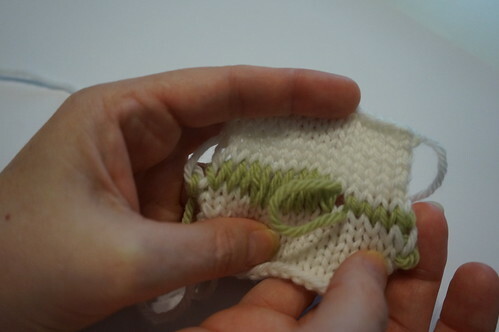 Our back stitch is a purl, so to “Same Off” purl this stitch and pull it off the needle. Before you do anything else, work an “Opposite On”: knit the next stitch (because it is a purl) and leave it on the needle. Now pull your working yarn through, but not too tight. 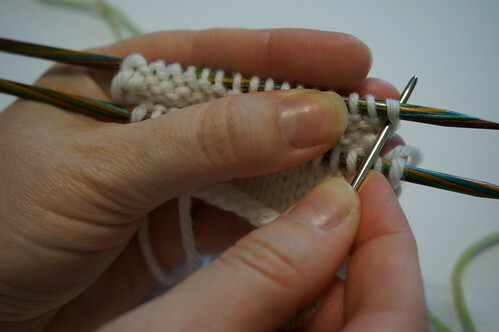 Move to the front needle, and repeat the process, this time with your knit stitches. 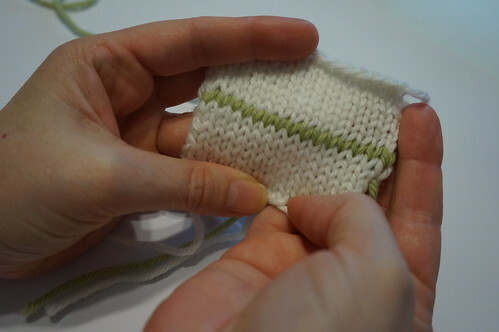 First, “Same Off” – so knit the stitch and pull it off the needle. 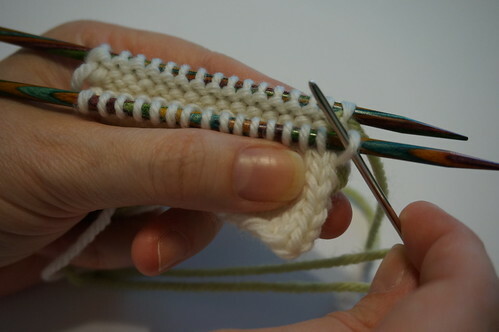 Now “Opposite On”, so purl the next stitch and leave it on the needle. Pull your yarn through, but not too tight. Looks sloppy, but we’ll fix it later. You’ll continue across until you get to your last stitch on each needle. You will work the “Same Off” step on each needle, but not the “on” step (since you have no more stitches on the needle!). You’re almost done! Now, we need to fix the tension across the row so it looks neat. 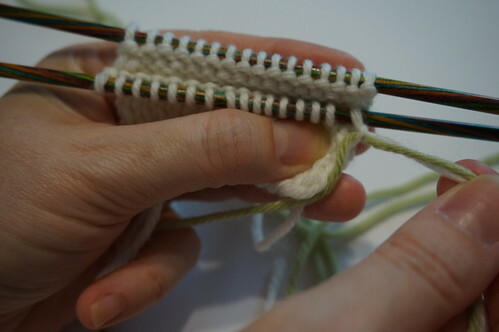 Starting at the end where you started grafting, pull each individual stitch, one side at a time, until you get a stitch that matches the tension in the rest of the knitting. Slowly work your way across the row until you get to the end. Weave in your ends and you’re done! Halfway done fixing the tension. If you’re still confused, I made a couple of videos that might make it more clear. 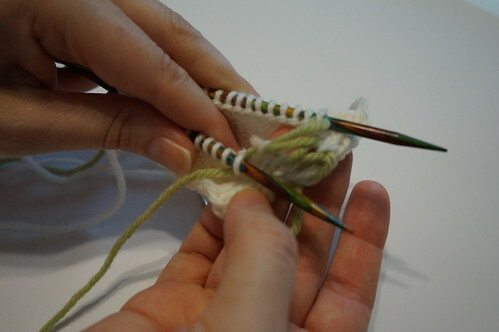 I walk you through grafting stockinette stitch, and then grafting the rib in the photo above. I hope this was helpful! Let me know if anything is still unclear, and feel free to add your questions or comments below! Oh thank you for your kind words! You’re welcome!